Please note: This game has monetized random reward mechanics, commonly referred to as "loot boxes." These mechanics are similar to gambling and are being investigated by Belgium's Gaming Commission, the Netherlands Gaming Authority, and other government bodies. Say goodbye to your last sliver of sanity – Sheogorath’s influence over The Elder Scrolls: Legends is about to take hold! The next major story expansion for Legends, Isle of Madness, arrives with chaos, calamity, conspiracy and (of course) cards galore! Over the course of three acts, Isle of Madness whisks players off to the Shivering Isles, where nothing is what it seems at first and no one can be trusted – least of all the Daedric Prince of Madness himself. Speaking of all-new cards, Isle of Madness debuts a whole new mechanic that will have players seeing double. Enter the Double Card – a card so nice, you can use it twice! A Double Card captures the essence of two distinct cards housed in a single vessel. Once drawn, the card splits, granting you two cards in the place of one! After all, why settle between a Baliwog or a Spawn Mother when you can have both? As players traverse the Isle of Madness, they will encounter all-new lane conditions that change up how they play their creatures. The Dementia Lane deals damage to opponents if you control the most powerful creature, while the Mania lane draws you a card for having the creature with the highest health. Some cards within Isle of Madness can convert existing lanes into Mania or Dementia lanes, so keep a sharp mind and learn to master these new conditions so that the insanity consumes your opponents rather than you! 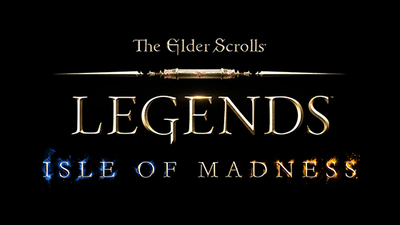 Once again, The Elder Scrolls: Legends receives an amazing expansion with Isle of Madness. Through an excellent story, great and fresh mechanics and a perfect mix between the both of them, the journey to Sheogorath's home is absolutely recommendable for anyone, whether it is a newcomer or a veteran of the game.